It's fitting for the iPad Air to have a new name, because it feels like an almost entirely new device. And for every second the Air sits in your hands, the iPads that came before it feel older and older and older. The iPad Air is light. Like, really light. One pound to its predecessor's one and a half. That's immediately evident as soon as you pick it up, but it's only once you feel the two side-by-side—or even back to back—that the sheer magnitude of the change really hits you. If this iPad is an Air, the previous generations are slabs of rock. If you're into the idea of using a 10-incher one-handed, there's no better option. It's still vaguely difficult to find a way to grasp such a large tablet in one hand without either pinching the screen or slipping your hand all the way down to a bottom corner. And the thinner side-bezels means you have a little less room to pinch, in a way. Like the iPad mini, the iPad Air is pretty smart about knowing whether you are just holding it at the edge or actually trying to interact with something, but pinching on the edge of the screen and not just the bezel is still a little psychologically uncomfortable, even if it's not causing any problems. But all in all the iPad Air's lightness makes all one-handed contortions instantly more viable than they ever were before, and that's fantastic. But it's not just light. It's also smaller in every dimension, and the effect is twofold: the beautiful 264 PPI screen feels more giant than ever and still looks wonderful even in comparison the army of phone screens that are repping increasingly dense resolutions. It's a very pretty screen to look at, and the rest of the device just sort of shrinks behind it. Speaking of the rest of the device, it's decidedly more premium than ever before. 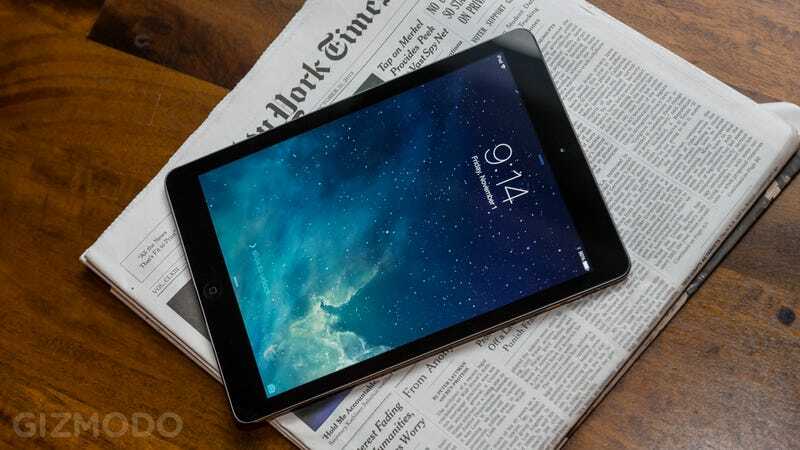 With the same chamfered edges and the still-rounded-but-more-angular back as the iPad mini, the iPad Air is stunning from the front, while feeling more compact and purposeful than ever on the back. That slimming down does have its subtle negatives though. The iPad Air has a little more flex to the screen than any iPad before it. It feels more "squeezable." When you press down hard, an iPad Air's screen will start deforming under your thumb far sooner than previous models. Likewise, if you really turn up the sound to blast from those bottom two speakers, you can feel every hint of bass reverberating through the iPad Air like it's some kind of musical rumble pack. Depending on what you're doing that might be cool, but it really does contribute to a subtle sense that the iPad Air's skinny little body is barely enough to contain it. Like a balloon that's just about to pop. But for the most part the iPad Air is a pleasure to hold, to grasp, to fondle. It feels so small for how big it is. So big for how small it is. And it does both in the best way possible. Of course all that would be pretty worthless if it wasn't for good guts. It's got them. This thing can cook. Apple's A7 chip is no slouch, and it zips right along almost as beautifully here as it does inside the iPhone 5S. Even with more than twice as much screen and tons more pixels to push, the A7 still rocks. Apps load nigh instantaneously; they zoom in with that iOS 7 flair and just load up like it's part of the process, with seldom an awkward hitch in between. And games run silky smooth as well, whether you are launching some irritated avian creatures or mowing down zombies in Dead Trigger. Of course, the 4th generation iPad with its A6x processor wasn't exactly a slowpoke—and it still isn't—but just a few minutes with the iPad Air really highlights its predecessor's age. What's really and persistently great about picking up an iPad Air, though, is just how new it feels. We've seen this design on the iPad mini, sure, but scaled up to 10 inches it's a whole new animal. And with the still-fresh flatness of iOS 7popping on the screen and zooming around admirably thanks to the A7 underneath, the iPad Air manages to breathe new life into an aging tablet lineage. That's a tough trick to pull off. Apple's unquestionably done it here.